Mobile service provider DeNA Co. has launched a free taxi-hailing service with "zero yen" rides available in Tokyo in 50 cars in the first round of a campaign running through the end of the year. 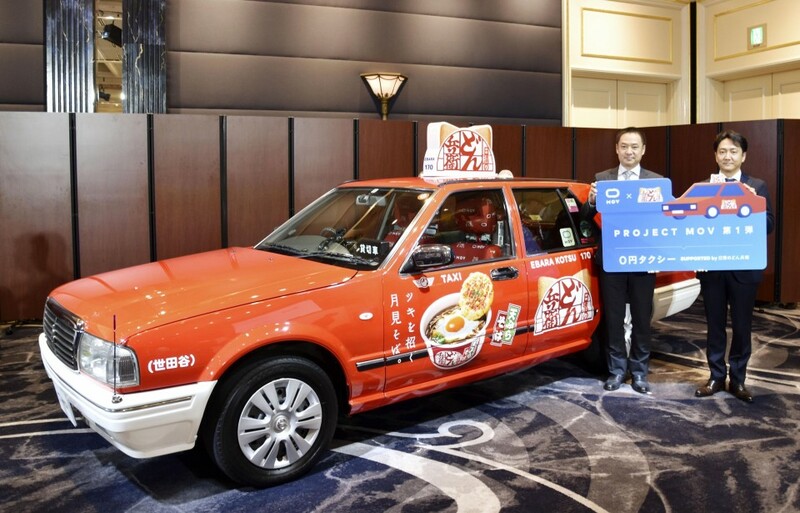 The body and the inside of the cabs will feature ads for instant noodles from sponsor Nissin Foods Holdings Co. Nissin will foot the bill for the rides, which will be provided through DeNA's MOV app. The journeys for this campaign will be limited to Tokyo's 23 wards, and passengers will have to pay the regular fare for a journey outside those wards. Passengers can use the service by specifying the location and selecting a taxi on a map on DeNA's MOV app. The MOV app's Tokyo service follows the launch in Kanagawa Prefecture on the outskirts of Tokyo. A fleet of 9,500 taxis is available for use with the app. DeNA, which has launched the service to try and grab a share of an increasingly crowded ride-hailing market, is looking to expand the service to the western Japan prefectures of Kyoto, Osaka and Hyogo next spring.